May 27th, 2008: Cloudy and Warm, Water Temp 72*. Caught Herring early this morning and picked the guys up at 5:30. Realizing this was the day after the busiest weekend of the summer I anticipated the Stripers would be deep and nervous. I looked for schools of fish for awhile but never found fish bunched up, Stripers were spread out over deeper flats near the bottom. We set up on a deep flat and put out downlines . I told the guys that the first 10 minutes of the mornings fishing would probably dictate how the day would go. If the fish wanted to eat, they would hit the bait head first and we would have a great day. If they just hit the tails to kill the bait, we would only catch smaller fish. We had 10 hits in 15 minutes, boating 4 Stripers, all punks. I moved on looking for larger fish and checking out different depths and parts of the lake hoping to find larger fish that we could trick into eating. After spending 3 hours on the motor today and fishing a dozen different areas my suspicions ended up being correct, fishing sucked today. 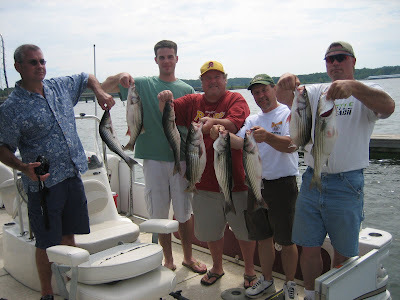 Although we had over 150 strikes and caught 15 Stripers, only 8 kept, and they were small. Can't wait for June and more stable weather patterns.